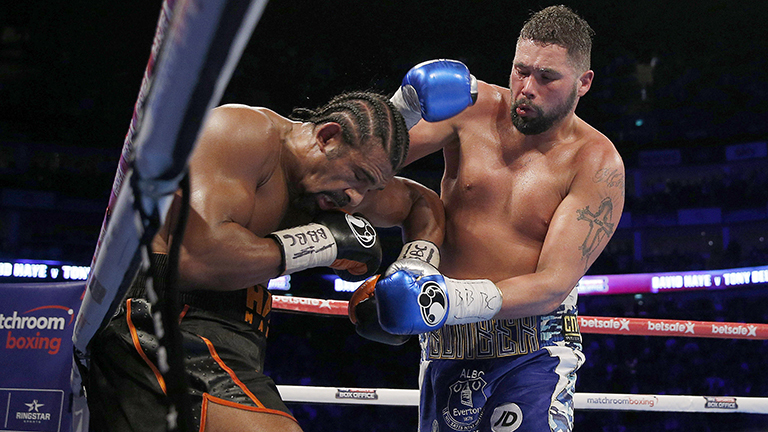 Tony Bellew and David Haye will have a rematch, but the fans will have to wait five more months, as Bellew-Haye II has been set for May 5, 2017, at the O2 Arena in London. Bellew (29-2-1, 19 KO's), 35, of Liverpool, stopped a badly injured Haye in March at the same venue. There were reports leading up to the fight that Haye suffered an Achilles injury, and the former two-division world champion flew to Munich just four days before the bout to see a sports doctor. Haye (28-3, 26 KO's), 37, of London, was deemed fit to fight. However, his Achilles tendon snapped, and Bellew knocked him down twice before trainer Shane McGuigan threw in the towel to halt to halt the action. A rematch was slated for December 17, but Haye was forced to pull out of the fight after he damaged his bicep falling down a flight of stairs. There was some talk of former heavyweight titlist Tyson Fury replacing Haye after the brash, outspoken warrior called out Bellew. The former cruiserweight world champion was quick to accept the challenge but opted to go for the Haye rematch instead, which drew the ire of his fellow countryman. "Got some bums trying to big up their name by using mine to gain credit," Fury said of Bellew. "I'm pleased to get a new date in the diary, and I look forward to giving boxing fans a great night on May 5," Bellew said in a news release. "To be honest, I was looking forward to a great victory in December and a relaxing family break over Christma, but my mind is still very much on this fight, and I will punish him for that. "I now have a very clear plan for 2018, and that is to knock out David Haye and then knock out Tyson ‘Stavros Flatley’ Fury and end both their careers, but first things first I need to rid the sport of David Haye on May 5, and I look forward to doing this in what I believe will be an explosive fight." Haye admits that his career is on its last leg. "Whilst the first chapter of the Haye-Bellew saga didn’t go my way, fans were left on the edge of their seats throughout the thrilling 11-round battle,” Haye commented. “The rematch in May will no doubt eclipse this. Tony has boasted that the rematch gives him the opportunity to force me into retirement. Unquestionably, I step into the ring on Saturday, May 5th with both my career and legacy on the line. "After my freak accident down a stairwell last month I was heartbroken not to give everyone the ending to 2017 I wanted. Since then, I had to accept the cards I had been dealt, remain positive and focus on factors which are within my control; rehabilitation and rescheduling the fight."